Look at the broader situation and it becomes clear how few of Marco’s promises have actually been fulfilled. True, a lot of Earth people are dead, but the survivors still outnumber the Belters by a huge margin. Now they are highly motivated to apply their productive potential to removing the Belters as an issue. Most of Marco’s specific targets — James Holden, Fred Johnson, Chrisjen Avasarala — are still alive and working against him. He has not established a functioning economy independent of Earth and Mars and without one, the Belters will die. As far as Marco is concerned, all of his victories (and Marco is very good at declaring victory regardless of outcome) are thanks to Marco’s unparalleled genius. Those few defeats he will grudgingly admit are clearly the fault of his subordinates. It’s no surprise that that Marco’s allies have begun defecting from the Free Navy. Earth is unwilling to wait for the slow erosion of the Free Navy to remove their great enemy. Far better to draw the remnants of Marco’s forces into a single, decisive battle. The problem is how to draw Marco out. The answer? Offer him the one bait Marco cannot resist: that vexing adventurer known as James Holden. I dislike plots that turn on megadeaths. I hated the choice the authors (James S. A. Corey is the pen name for authors Daniel Abraham and Ty Franck) made, to kill off half the population of Earth as just another plot point. Not only that, the attack shouldn’t have worked. Asteroids aren’t stealthy. Only one point in favor of this authorial decision; the attack was ordered by a megalomaniac villain. It wasn’t presented as a hard decision by a protagonist willing to make the tough choices. I dislike such protagonists. The Belters in general don’t seem bothered that fifteen billion people were murdered. Well, people are generally comfortable with dead foreigners: ask an American, for example, how many people died during George’s Excellent Iraqi Adventure. The Belters should recall that the fifteen billion people who survived don’t actually need the Belters. They need some raw materials from the Belt, sure, but they can easily wipe out the current Belter population and resettle the Belt. James Holden seems to be moving past his usual plot function, which is to facilitate avoidable disaster exciting events by doing the right thing, as he sees it, at the worst possible time. An Earthian with a Belter lover, he’s more concerned with the fallout from Marco’s attack on Earth than the Belters seem to be; his one-man effort to get both sides to see each other as people is part of that, as is his solution for the manner in which the new extra-solar colonies may sideline the Belter culture. Go, character growth. This book didn’t seem to function as a standalone. It resolved issues from the previous book while setting up future books. I had the feeling that the authors were checking off plot boxes. I slogged through it, rather than racing through it, anxious to find out what happened next. This is not my favourite book in the Expanse series. Too much war, and I am not a fan of the war plots. It was clear by Caliban’s War that war is a terrible choice for people living in fragile habitats; I didn’t really need further proof. 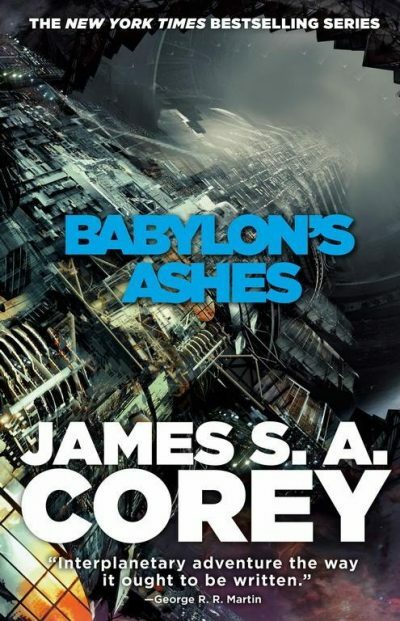 Babylon’s Ashes is available here (Amazon) and here (Chapters-Indigo). A small editorial correction to the text. To B or not to B: " thanks to the Welter Free Navy’s asteroid attack"